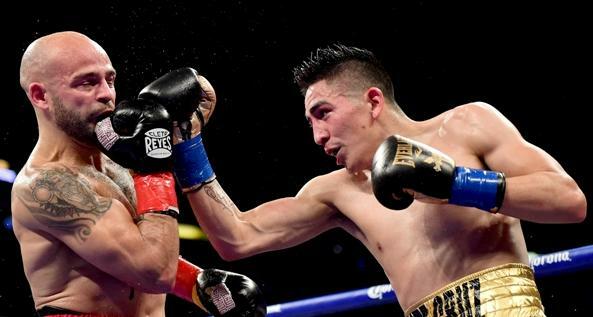 ANAHEIM, Calif. — Leo "El Terremoto" Santa Cruz convincingly beat Kiko Martinez with a fifth-round stoppage in the main event of a Showtime Championship Boxing telecast Saturday night, and with the victory successfully defended his WBA featherweight title for the first time. It didn’t look as though it would last as long as it did once the opening round materialized. Santa Cruz unraveled his fluid combinations from the jump, and a right hand stunned Martinez within the first 90 seconds of the fight for a knockdown. It was seemingly a flash knockdown, as Martinez quickly got up, but Santa Cruz sent him back to the mat with a more definitive right hand moments later. The announced 7,780 at the Honda Center erupted, but the Spaniard dug deep and managed to survive the round. Former world titlist Kiko Martinez might not have been the best name unbeaten featherweight titlist Leo Santa Cruz could have been facing on Saturday, but the native of Spain certainly gave him all he could handle. Santa Cruz (32-0-1, 18 KOs) made the first defense of his featherweight belt by defeating a determined Martinez via fifth-round TKO at the Honda Center in Anaheim, California. Martinez (35-7, 26 KOs) got off the canvas twice in Round 1 and routinely backed Santa Cruz up in an entertaining slugfest as the two fighters combined to throw over 1,000 punches in less than five full rounds.